Update 1/10/19 - The Amex Gold no longer has a Rose Gold option, but its welcome bonus has been bumped from 25,000 to 35,000 points, with the same $2,000-in-three-months spending requirement. Nice! While the Chase Sapphire Preferred is essentially a cheaper, stripped-down version of the Sapphire Reserve, the newly relaunched American Express® Gold Card offers unique benefits and incredible bonus earning capabilities that you won’t find on its more expensive brother, the Amex Platinum. If you spend $2,000 on the Amex Gold in your first three months, you’ll net 5,000 Membership Rewards Points (if you’ve never been an Amex Gold cardholder in the past), which can be used to book travel directly through Amex Travel, or transferred to a wide array of airline and hotel partners, including JetBlue, Delta, and Hawaiian Airlines here in the U.S. These transfer options are why The Points Guy values Membership Rewards Points at 1.9 cents each. The Amex Gold card is the most rewarding card you can use to buy food in the U.S., full stop. You’ll earn 4x points at all U.S. restaurants, and 4x points at U.S. supermarkets. The latter is capped at $25,000 per year, but that should be more than enough for almost any family. Let’s say you get TPG’s estimate of 1.9 cents worth of value out of your points. That means you’re effectively earning 7.6% back on every dollar you spend on food. That’s simply unmatched by any other card. 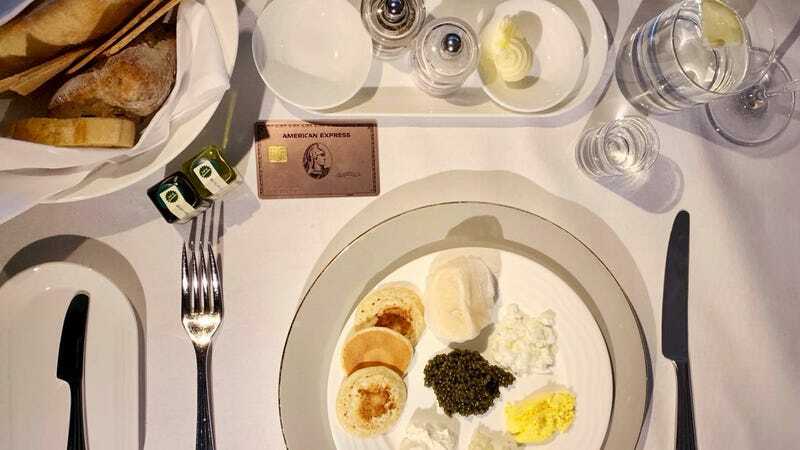 In fact, the more-expensive Amex Platinum only earns one point on each of those categories, making the Gold Card a great companion to the Platinum if you want to maximize your spend. You’ll also earn 3x points on flights booked through the Amex travel portal, or directly with the airline, though it’s worth noting that the Platinum card earns 5x points here. Otherwise, you’ll earn the standard 1x point per dollar on every other purchase. The Amex Gold carries a somewhat hefty $250 annual fee, and it’s not waived in the first year, though it can be largely or entirely offset by annual credits and perks. The Amex Platinum, by comparison, costs $550 per year. $120 annual restaurant credit, available in $10 monthly increments at Grubhub, Seamless, The Cheesecake Factory, Ruth’s Chris Steak House and participating Shake Shack locations. That’s obviously not a huge selection, but Grubhub and Seamless should cover most of your go-to takeout joints. $100 annual airline incidental credit, valid on one participating airline of your choice. You can change the airline once per year in January, but this credit would cover things like checked bag fees and in-flight food and beverage purchases with that airline. Unfortunately, it isn’t valid on tickets or seat upgrades. $75 hotel credit when you book a two night prepaid stay through Amex’s Hotel Collection. You’ll also earn double points on the booking. All told, they aren’t exactly the most convenient set of perks you’ll find, but if you max them out, you’ll more than cover the Amex Gold’s annual fee. The new Amex Gold seems to have found an underserved niche in the travel reward credit card ecosystem. It’s less expensive than top-tier cards like the Chase Sapphire Reserve and Amex Platinum, and has better perks than the Sapphire Preferred or Capital One Venture, but arguably offers the best bonus categories in the entire industry. If you already have an Amex Platinum, this seems like an incredible (if somewhat pricey) complement. 4x points on dining and travel will supercharge your ability to accumulate Membership Rewards points. But if you’re just starting out in the travel rewards space, consider whether you’d be able to take full advantage of the annual credits. If you fly a lot (and pay for incidentals) on a single airline, and order takeout monthly from Grubhub or Seamless, the Amex Gold should get serious consideration as your first premium card.